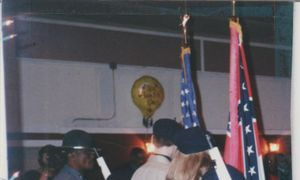 In 1999, Chief Tommie Lee, and Assistant Chief Rodney (Tater) Murray, came up with the idea of taking the local kids on a trip to the Pearl Police Academy, in Pearl Ms.They took about thirty children on the trip, with Alderwoman Jane Bell.They visited the state capitol, and at the end of the day returned to Gloster. I was hired in May of 1999 at The Wilkinson County CCA Prison Facility, as a Correctional Officer. During my stay I was selected to organize the first Boot Camp in the prison.I had 64 Inmates assigned to my zone, and was able to train the young and old offenders, and teach them discipline using military training. "IT WORKED". 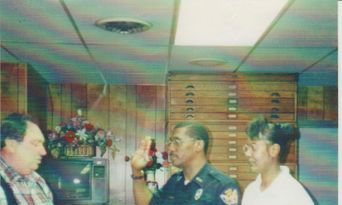 I had submitted an application to the Gloster Town Hall to fill the vacancy for a Police Officer,In June 2000, I was hired as a Patrolman. I am sworn in by Mayor William (Bill) Adams as a new Police Officer. "IT DIDN'T STOP THERE". 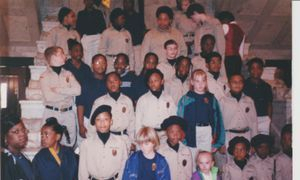 Ok, Chief Tommie Lee had this idea, he filled me in on the kids trip to Jackson, and it was a one time thing. He wanted to take this a little further, game plan was in effect, The Jr. Police was born to the town of Gloster. As you can see, we are ready for our first Christmas Parade in Centreville, Ms..It took a lot of hard work getting the children in shape. Every Saturday Morning we would start of with a stretch, then 10 pushups, jumping jacks, bend and reach, duck walk, squats, and 10 more pushups. We would go for a 5 minute run, and then we would cool down for drill instructions. 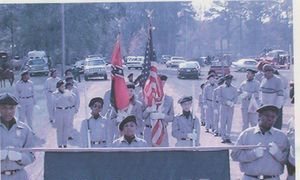 We had Fire Safety Classes, CPR, Leg Splints, Deadman Carry, Fireman Carry, Heat Stroke Classes, Fold The US Flag, Funeral Details.Color Guards, and the art of Marching to Cadence. Visited The State Capitol, Visited with Representative David Green of Gloster. Toured The House Of Senate, Met The Gov. Our first Valentine Ball at Lamp Light Cafe 2001 with the Color Guards, Gloster Ms. Instructors: Mrs Jessie Miles, Mrs Monzella Tickles , Mrs Yolanda Thompson, Advisors: Mrs Carolyn McGee, and Mrs Gwendolyn Smith. Staff Instructor: Jesse L. Miles Sr. Administrator: Chief Tommie Lee. Color Guards: Captain Dominique Faust, Zack Spradling, April Spradling, Steven Van-Dusen and Jack Sanders.